I’m just going to pretend that episode didn’t happen. Let’s ignore for a moment the substandard writing, haphazard direction, throwaway twist, shoddy sense of atmosphere, and poor use of the main characters and guests – we’ll get to these problems momentarily. Even if “Night Terrors” had enough redeeming values to make it worthwhile, the hour would constantly be undermined by the spot it holds in this sixth series. I don’t object to Doctor Who standalones on principle – this isn’t generally a heavily serialized show, and when I start naming Who masterpieces, they’re usually one-off adventures, like “Blink,” “The Doctor’s Wife,” “The Girl in the Fireplace,” “A Christmas Carol,” etc. But this season, Steven Moffat is telling a far more ambitious story, and that all came to a head in last week’s mid-season premiere, “Let’s Kill Hitler.” Given how much happened during that episode, and the gargantuan implications the story had for all the characters – especially Amy and Rory, who still don’t have their baby back – the show can’t return to business as usual without raising some eyebrows; as a faithful viewer, it’s distracting to go from the origin of River Song to a throwaway hour set in a London flat that could literally be sequenced anywhere in the season’s run. The other disposable episode of this season – “Curse of the Black Spot” – at least made reference to the events of the season premiere at the beginning and end, lending it a sense of time and place within the larger story. “Night Terrors” had none of that, so along with being generally disinterested in the tale of George the frightened little boy, I also felt constantly confused why the characters weren’t in any way affected by their adventure with Hitler, River, and the Teselecta. At the very least, shouldn’t Amy and Rory have seemed a little distraught about everything they’ve learned about their daughter? I don’t want to beat this point to death, but the sequencing of episodes within a season is important. I’ve said many times that I consider Doctor Who’s fifth series to be among the finest TV seasons I’ve ever seen, and part of the reason for its success was that it felt air-tight. The story-arc, about cracks in space and time, wasn’t present in every episode, nor should it have been, but the episodes flowed together extremely nicely because the characters and their relationships were constantly evolving. Every episode brought us to a point further than we were before on subtle or obvious levels, and that made it a powerful, engrossing experience. “Night Terrors” has nothing to do with anything, however, not the season’s story arc and, more importantly, not the characters; when you drop this sort of episode into the middle of a season that is highly serialized and has generally made good use of the cast, it looks very conspicuous. The squandering of our core trio probably irked me more than anything else. Especially with Smith’s Doctor, Amy, and Rory in the lead roles, I’m always more interested in the lives of our main characters than the lives of whatever guest stars the show has to offer, and I therefore have little patience for an episode that focuses on boring people we’ve never seen before rather than the wonderful set of characters that keep us interested in the show. That squandering started as soon as Amy and Rory were sucked away in the elevator; the plot device of separating the couple from the Doctor has officially been used too many times this season, and once they were separated, the Ponds were given nothing to do. They wandered about in the dollhouse aimlessly for what felt like an eternity, time that could have been spent having them discuss the fate of their daughter, their plans for the future, or something pertinent to what must be on their minds. I love Amy and Rory, and I hate seeing Karen Gillan and Arthur Darvill go to waste like this when there’s so much more they could be doing; from prior episodes, we know Gillan and Darvill are great acting opposite kids, so why not have Amy and Rory help the Doctor help George, rather than rob the episode of the core trio’s chemistry? As for the Doctor, he fared quite a bit better than his companions; part of that is that Matt Smith turns any material he touches into gold and is entertaining no matter what the situation, but in an episode full of underwhelming writing, much of the Doctor’s dialogue was legitimately impressive (especially when mentioning bedtime stories like “The Emperor Dalek’s New Clothes”). Smith delivered it all fantastically, continuing to deliver one of the best performances on TV, and even if I generally despised the story, I was entertained whenever the Doctor was on screen. That makes “Night Terrors” reminiscent of season two’s “Fear Her,” another low-point in the series involving a frightened child where the only reason to watch was for the Doctor’s antics (then provided by David Tennant who, like Smith, can keep even the worst of scripts afloat). Nevertheless, “Night Terrors” was a total mess from start to finish, and I’m quite frankly flabbergasted this script got produced under Steven Moffat’s watch. I’ve liked writer Mark Gatiss’ previous Who scripts, particularly the ninth-Doctor story “The Unquiet Dead” and last year’s “Victory of the Daleks” (and Gatiss’ work with Moffat on Sherlock was positively inspired), but “Night Terrors” is simply incoherent. The first half of the episode did a terrible job building any sense of tension – it was clear as soon as Amy found the wooden skillet that she and Rory had been shrunk and put in the cupboard – or turning George and his Dad into likable characters, but I could forgive these flaws if the payoff was satisfying. It wasn’t. There’s certainly potential in the twist about George’s alien origin, but the revelation was presented in a wholly un-engaging way, and only led to many unanswered questions. If George is a disguised alien, what made him afraid in the first place? Why were there singing dolls turning people into plastic? Why was George scared of the elevator sound? If Gatiss had taken some time to develop these ideas, to demonstrate how sights and sounds ordinary to humans would be foreign and frightening to an alien child, then I think we could have had something interesting on our hands. But that’s not what we got, and Gatiss even had the nerve to resolve things with an entirely unearned emotional beat: George’s Dad professing his fatherly love for the child. George clearly loved his son at the beginning of the episode, so the only ‘arc’ these characters had was one of rediscovering the feelings they started with, and that’s just downright sloppy writing. Speaking of sloppy, Richard Clark’s direction didn’t do the episode any favors; visually, I found the episode unappealing, and moments that should have been scary – such as Amy and Rory’s elevator drop, the old lady being sucked into the dumpster, or the Doctor and George’s father being transported into the cupboard – came across as empty camp, without a hint of tension or surprise. Clark is a very talented director – he helmed “The Doctor’s Wife,” one of the most visually awe-inspiring episodes in all of Doctor Who – so I’ll just assume he had an off-week. Murray Gold, on the other hand, continues to blow me away with his musical compositions; as much as I disliked “Night Terrors,” I can’t wait to hear pieces from the episode on the soundtrack. 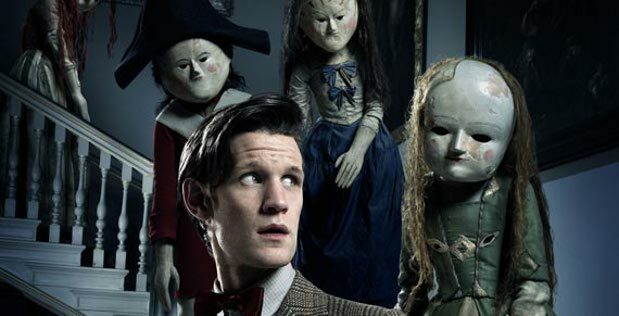 By my estimation, “Night Terrors” is the first outright stinker of the Moffat/Smith era; it was inevitable, I suppose – all streaks have to end sometime – but still disappointing. I’m crossing my fingers hoping that the show can make it through the rest of this season without any more structural problems, because as it stands, episodes in this season have been far too heavily split between “story-arc” and “standalone.” If Moffat intends on telling another grand story next year, he’ll have to find a better way to weave story and character development through all episodes in the series. More importantly, he’ll have to reject scripts like “Night Terrors,” which have no business sullying the Doctor’s good name.